Relentless Youth Ministry is where youth have fun, play games, hang out, and experience the love of Jesus! Everything we do is to build friendships with youth so that they can develop a relationship with Jesus! Relentless Youth Ministry meets several times every week! We have youth services during our normal church services, Sundays at 7, 9, 11am and Wednesdays at 6:30pm. We also have nights dedicated to our high school and junior high students. Thursdays are for our high school students and Fridays are for our youth in junior high. Both nights start at 6:30pm and end around 9:00. During our Youth Ministry nights, we have dinner available as well as van rides for youth who need a ride. 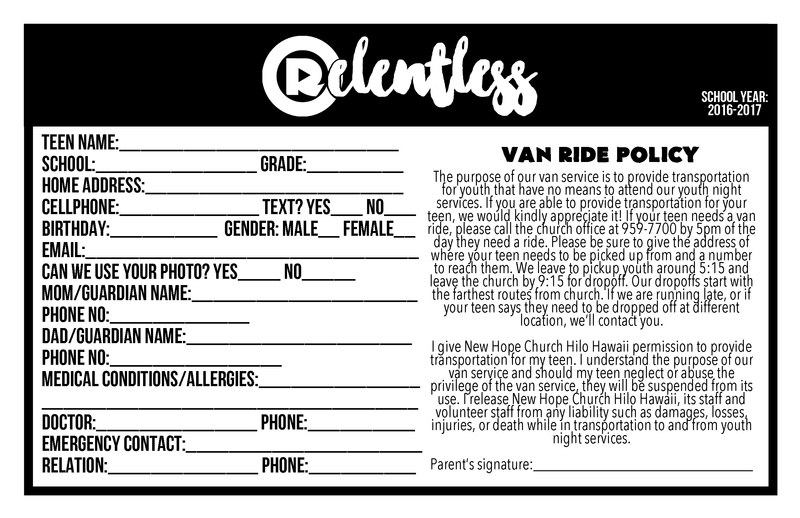 If your teen needs a ride to our night services, be sure to call or text our Relentless Van Rides number, (808)765-9147, before 5pm the day of service. Be sure to fill out a van ride form (for van ride forms, click here) and have your teen turn it in. Every Relentless service has activities for youth to particpate in and a message that relates to them!